Fate: She was deemed a constructive loss in May 1945 she was scrapped one year later at Troon. From Mr. C. A. Cheetham of Risedale Central School Barrow. We adopted the Terrapin in the autumn of 1943 when she was completing. The adoption was arranged by Mr. Wheller, an Admiralty Overseer at Barrow, who has been instrumental in three or four schools in Barrow adopting new submarines. The ceremony of adoption took place before the assembled school in the presence of the Commander, then Lt. D. Martin, triple DSO, his officers and ratings. Admiralty and Vickers-Armstrong representatives and the Director of Education. The Commander addressed the scholars, and they all saw his latest decoration which he had received from the King the previous day, and various Officers and Petty Officers also spoke. We had collected a large number of comforts for the new crew, card games of all kinds, new packs of cards, dominoes, draughts, almost any game you care to mention, games of chance and skill. The girls had knitted socks and the scholars gave up their sweet coupons, some of their grand-fathers gave us the whole quarter-years sweet coupons for our submarine. We had books and illustrated magazines. These were all displayed on tables at the ceremony. The Captain presented us with a copy of the submarine’s coat of arms (submarine crest? ), beautifully carved in oak, and the school presented the ship with a Jolly Roger flag (which, incidentally, is now well decorated from all we hear). The submarine was still here when we held our Christmas parties and we invited all the crew in three sections to our three parties. They thoroughly enjoyed the dancing, games, concert and tea at the parties, and we sent them off on their Christmas leave with each member of the crew who had children having two toys for each child, the toys made at school (dolls in the needlework room and wooden toys in the woodwork room). Before she sailed for trials, the staff visited the submarine. Since the submarine sailed, we have from time to time, sent parcels for the crew, sea-boot stockings, cards, books, magazines, diaries (naval) for each member of the crew, a gross of razor blades, games of all kinds, and just before Christmas we sent 2,500 cigarettes, and combs, housewives etc. On one occasion the five parcels we sent weighed altogether ½cwt. In each parcel the scholars sent personnel letters to the members of the crew who they got to know at the parties and Adoption Ceremony, and many of the children write periodically and receive personal letters. We are hoping when the ship gets back to England the crew will visit the school for a reunion, and that they will give us the Jolly Roger with its decorations. If there is any way in which we can help the crew, we are only too glad to do so. We have the money, given by the children, but there is not much we can buy. There you have it, "Terrapin" so if you want, don’t be afraid to ask. Incidentally, I hope you like the sketch of your coat of arms drawn by 13 year-old Ken Beach. 24-03-1944 : HMS Terrapin attacks a German convoy off Egersund, Norway and torpedoes and damages the German kataput ship Schwabenland and the German tanker W�rth. 05-08-1944 : HMS Terrapin bombards Japanese installations at Gunung Sitoli, western Sumatra. She also sinks a Japanese coaster with gunfire and damages another. 30-10-1944 : HMS Terrapin sinks three Japanese sailing vessels with gunfire in the Malacca Strait. 02-11-1944 : HMS Terrapin sinks the Japanese auxiliary netlayer Kumano Maru in Strait of Malacca. 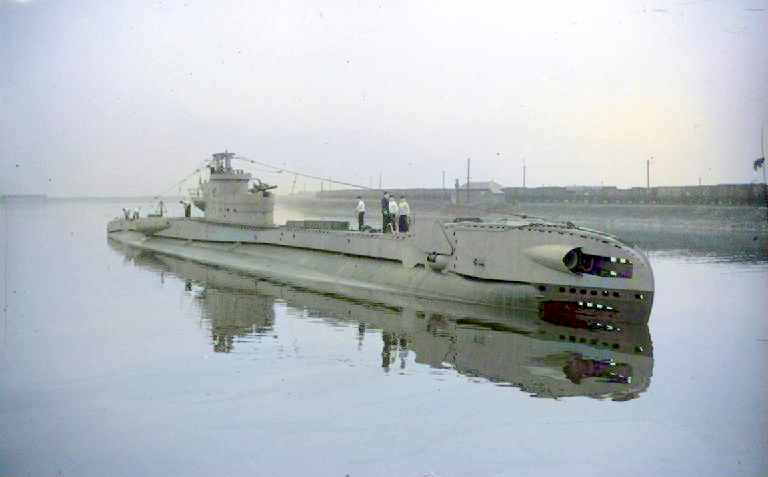 04-11-1944 : HMS Terrapin torpedoes and sinks the Japanese minesweeper W5 in Malacca Strait. 22-12-1944 : Accompanied by HMS Trenchant. They sink the Japanese tanker Yaei Maru No.6 with gunfire off the south side of the Japanese Fleet anchorage at Lingga Roads. 29-12-1944 : HMS Terrapin sinks a Japanese sailing vessel with gunfire in the Malacca Strait. 30-12-1944 : HMS Terrapin sinks two Japanese sailing vessels with gunfire in the Malacca Strait. 01-03-1945 : HMS Terrapin sinks two Japanese sailing vessels with gunfire in the Strait of Malacca. 02-03-1945 : HMS Terrapin sinks a Japanese sailing vessel with gunfire in the Strait of Malacca. 17-05-1945 : HMS Terrapin sinks a Japanese sailing vessel and damages another with gunfire in the western part of the Java Sea.